This new release is not only packed with many new features, but is also extremely optimized. It will perform five to fifty times faster than the previous versions making Folder Size the fastest application of this type. We have now provided Personal and Professional versions that include important new features. The flexible filtering will let you include or exclude different types of files and folders based on name, size, date/time and attributes. Folder size now supports project files and can quickly save and load huge amounts of scanned data in small packed files. The print feature will let you print the detailed list of the files and folders. 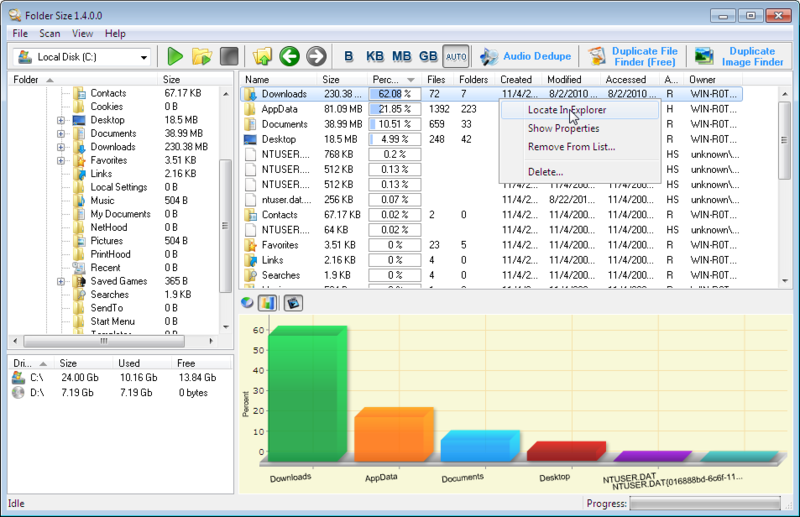 Some columns like file size, folder size, files count, folders count etc. are now formatted to the right for easier reading. The professional version provides export feature and can save the scan results in XML or CSV files. Some bug fixes are applied. Folder Size now will install for all user accounts by default. In previous version trying to use the application from another user account was leading to issues. You can check the entire Folder Size change log here. Click this link to see a comparison table of the features supported by the Free, Personal and Professional version. This entry was posted in Folder Size, News and tagged Disk Size, Fast, Fastest, Fiel, File Size, File Szie, Flie, Floder, Foder, Folder, Folder Size, Folder Size Analysis, Folder Size Analyzer, Foldersize, Quick, Scan, Size, Speed, Szie, Tree Size on April 3, 2012 by MindGems Support.